No-kink oxygen tubing 50' length, 20 per Case. Green no-kink tubing uses 3-channel construction, does not coil up. No-kink oxygen tubing 25' length, 25 per Case. No-kink tubing uses 3-channel construction, does not coil up. Purple - Case of 25 McKesson Brand 25-foot Smooth 3-Channel tubing for home Concentrator. Purple for safety. 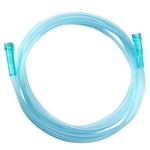 Clear - Case of 50 McKesson Brand 10-foot Crush-resistant Oxygen Supply Tubing for home Concentrator. Clear - Case of 50 Salter Labs 10-foot Crush Proof tubing for home Concentrator. Remains straight when uncoiled. Includes 2ea. Salter Labs #2050, 50' tubing and splicers if you need 100' length. Salter Labs oxygen hose works great with home concentrators. Clear - Case of 25 Salter Labs 25-foot Smooth 3-Channel tubing for home Concentrator. Connectors have ribbed end with rounded, tapered edges. Green - Case of 25 Salter Labs 25-foot Smooth 3-Channel tubing for home Concentrator. Connectors have ribbed end with rounded, tapered edges. Clear - Case of 20 Salter Labs 50-foot Smooth 3-Channel tubing for home Concentrator. Connectors have ribbed end with rounded, tapered edges. Green - Case of 50 Salter Labs 14-foot Crush Resistant Oxygen Supple Tubing. Water trap for oxygen hose/tubing keeps tubing nice and clean. Traps excess condensation, can easily be cleaned. Buy the 10 pack here and save. DISS Adapter, case of 25.